Generac® is the industry leader in generators, and Peace of Mind is proud to be an Authorized Dealer. 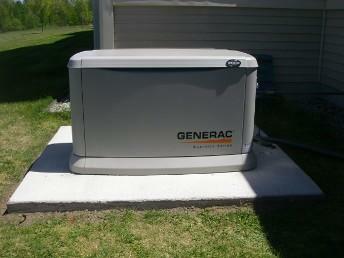 As an authorized dealer, Peace of Mind services is certified to install and service Generac® generators. Peace of Mind Services also inspects and repairs generators of other brands including General Electric (GE), Caterpillar, and Cummins among others. Regardless of fuel type – gasoline, diesel, or alternative – Peace of Mind’s Houston generator service technicians will be there to assist. Routine maintenance is important to making sure your generator is working properly. Standby generators have a service life of up to 30,000 hours. Your generator may only incur occasional use – sometimes, depending on the situation, frequent use. Regardless, your generator should be inspected regularly. Houston’s climate presents special challenges for certain generators. In fact, Houston’s humid climate may require some systems to be inspected and serviced more often than others. That’s why it is important that not only you have a preventative maintenance plan, but also do your own visual inspection at least once a month. Check fuel levels, alternators, transfer switches, starting system, lubrication system, coolant system, and fuel system. Faulty generators can lead to serious issues, including problems that could put you and your employees in danger. Routine inspections and a preventative maintenance plan can catch problems before they start. Contact Peace of Mind Services for your Houston generator service needs today!